Running Fred | Play Online !!! 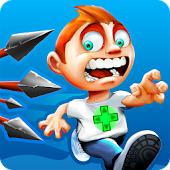 Running Fred is a free fast-paced castle adventure game. In this online game, death haunts you and the ultimate challenge is to run at full speed while swerving the lethal obstacles and jumping across platforms. Quite frequently, you can choose to go right, left or down, up, but be aware that no path is deprived of dangers. This game allows you to customize the hero of the game as you wish, so feel free. The main point of Running Fred is to overcome, and dodge various obstructions. If you are still unsure on how to get started, then have a look at the main instructions and go ahead. The distance needs to be covered and all the info will be displayed on your screen right as it’s happening! It is all about scores and speed, and overcoming hurdles of course. Definitely not easy but isn’t that what makes a game challenging and interesting. In the current game setting, there are numerous flash games that pose precise and distinct challenges to players. These types of challenge can range from methodical and masochistic to obscure and plainly silly. if you are perhaps the type of player seeking for methodical and masochistic, then Running Fred is the game for you. – Several game modes which include Challenge Mode, Adventure Mode and Endless Survival Mode. – You are at liberty to pimp Fred with distinct outfits. – Characterized by numerous perilous traps. – Your progress is saved up across all the devices you play using. In this game, there is the first character Fred who is running for his life, maneuvering through a host of deadly traps and snares with another character the grim reaper pursuing from behind. The obstacles that Fred encounters in his escape for his life is a combination of minor setbacks designed to simply knock him out and other distinct obstacles engineered to instantly kill him. As Fred powers through crazy and gaping levels, he is under trail of his worst night-mare, the grim reaper and as a player, your job is basically to maneuver, avoid and duck numerous deadly obstacles while accumulating both silver and gold coins in as many amounts as you can. When playing, the choice is up to you; whether to take a left, right, up or down maneuver. You can also tap your screen to give you double-jumps.